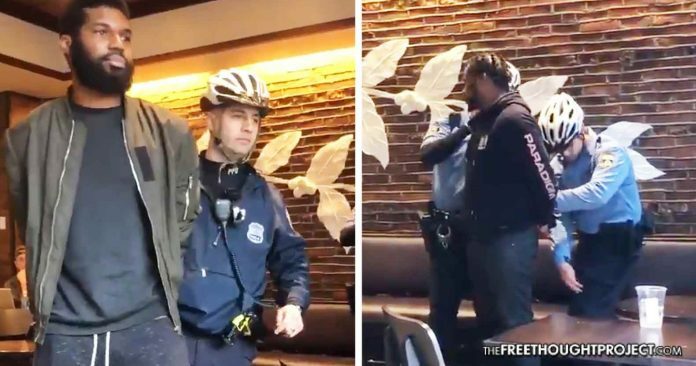 WATCH: Two Men Arrested for Waiting for a Friend in Starbucks—"While Black"
Starbucks and the Philadelphia police department are on the defensive as a video has gone viral showing them allegedly arresting two men for "waiting for a friend while black." Philadelphia, PA — A video of two black men getting arrested inside a Philadelphia Starbucks coffee shop this week has sparked outrage online. It has also prompted an “internal investigation” from police after there was no reason given for the arrest other than the men were waiting for a friend. The video was shared on Twitter Thursday by @MissyDePino, which shows the two men being handcuffed and taken out of the coffee shop at 18th and Spruce Streets. To illustrate the unjust nature of the arrest, the friend that the two men were supposedly waiting on actually showed up as his friends were being handcuffed. The man who showed up even explained to police that they were waiting for him to get there before they ordered. However, they were cuffed and arrested anyway. As Philly.com reports, the identities of the people seen in the video and why they were handcuffed and taken out of the Starbucks by numerous officers remain unclear. District Attorney Larry Krasner’s office, reached through spokesman Benjamin Waxman on Saturday, had no immediate comment on the incident. However, witnesses say they know what happened. “What did they do?” asks the friend of the pair now in handcuffs. As the video went viral on Twitter, it prompted users to call for a boycott of Starbucks and also urge them to respond. You know what else is funny? When you get arrested in a Starbucks just for being black. Oh wait, that’s not funny. That’s racist as hell. Seriously, I hope the people responsible for this at the 18th & Spruce location in Philly are fired & sued. Two men (black) were waiting for their client at a Philly Starbucks. The barista called the cops & they ended up getting arrested. kid in Michigan (black) gets shot at while asking for direction. The racism is real, folks. “We’re aware of the incident on Thursday in a Philadelphia store with 2 guests and law enforcement, resulting in their removal. We’re reviewing the incident with our partners, law enforcement and customers to determine what took place and led to this unfortunate result,” the company wrote. Also forced to issue a response to the alleged racism was the Philadelphia Police department whose officers removed the seemingly innocent men from the store while they waited for their friend. They released a statement Friday night noting that an internal investigation was under way. “We are aware of an incident that occurred on 4-12-18 at the Starbucks Café at 18th and Spruce. The entire incident, including the actions of the responding officers, is under internal investigation. Once we gather all the facts, we will comment further,” the police statement read. It is certainly the right of Starbucks—as they are a private establishment—to refuse service to anyone they desire especially if they are being unruly and causing a disturbance. However, according to eye-witnesses, these two gentlemen had done nothing wrong, had not disturbed anyone and were merely waiting for their friend, who eventually showed up. This scenario plays out in restaurants and private businesses across the country as polite friends sit without ordering anything while they await their guests. If this man was really their friend, the police should have uncuffed the pair and immediately let them go. But this does not appear to be the case. The Free Thought Process contacted the Philadelphia police department to inquire about the official charges these men faced, however, they did not comment citing the ongoing investigation. The Free Thought Project also contacted a representative from Starbucks who informed us that their only unofficial policy in regards to people being in the store without purchasing something is no sleeping. The representative told us that people who don’t buy anything can essentially stay in the store all day long and they will not ask them to leave. In this instance, however, it appears that these men were not granted that privilege.